Rhagodia candolleana (coastal saltbush - described as Rhagodia baccata in the Student's Flora) is a low and often straggling shrub that occurs in along the coast and in saltmarshes. The leaves are distinctive - small, quite broad, shiny green on the upper surface and white on the under surface with collapsed bladder-hairs. 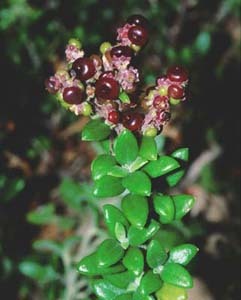 It usually has many small red fruits. Einadia nutans was previously known as Rhagodia nutans.